QWOP the original flash based sprint game has fallen to the lure of Android. Noodlecake today launched the Android version of the game on Google Play for Rs.56.00 The game is a very good entertainment combined with skills and is a must have if you are into gaming especially on mobiles. You play Qwop in the game and have to finish a race. There are two touch pads given on the Android version as seen in the image above. Your objective is to control Qwop's movements with these two controls and at the same time use the thumb in a clock work motion to keep Qwop running forward. 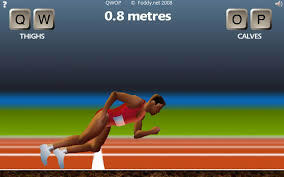 Beware if Qwop falls down you your finished. Those who have used the flash based version of the game will remember that the controls on PC were through the keys Q and W for Qwop's right leg and O and P for left. The participation is very very entertaining as you will fall for umpteenth time till you get the hang of controlling Qwop. In the meantime you may forget that Qwop has a race to finish. Noodle has integrated the game with Google's Play Game service which makes it even more fascinating because you have a global leaderboard. After the Temple Run and Angry Birds kinds of games this is welcome change because it is funny, requires skills with touch pad and addictive as well. Remember it cost $0.99 (Rs.56.00) and is worth every penny. Download the game from Google Play now.